Entrance tickets and passes, depending on the type purchased, entitle you to access the Aquarama park expressly indicated and in each case you can enjoy according to its validity, and in accordance with the calendar and schedule of opening of each installation, either in whole or in part, of the rides and the rest of its facilities, always respecting the access, operation, operational and safety restrictions. The current rates for each entry modality are those published on the website www.aquarama.net, which are subject to revision and changes. Confirm the daily rate at the time of purchase. . There are services not included in the price of the entrance ticket or pass, inquire in the Customer Service Office the conditions of acquisition and use of them. Check conditions, as well as access restrictions, in the Customer Service Office or in the same unit. Aquarama only admits tickets and / or promotions acquired in official points of sale, not responding in any case to the tickets or promotions acquired through unofficial channels. Entrance tickets, sun beds or wardrobe tickets, shopping tickets, etc. must be kept throughout the stay in the Aquarama facilities and, where appropriate, shown to our staff who so require to verify the correct use of the same. Entrance tickets, lounge tickets or cloakroom, Aquarama products and promotional coupons are not refundable under any circumstances. Nor can the validity date be changed. No tickets or promotional coupons broken, amended, photocopied or damaged will be accepted in any case. The entrance tickets, the promotional coupons, cannot be resold, being of a personal and non-transferable nature, so Aquarama reserves the right to verify the identity of its bearer each time they are used. Aquarama is not responsible for the loss or theft of tickets, passes or coupons by Customers. In cases of excessive public attendance to Aquarama that could hinder the operation of its facilities and / or for security reasons, Aquarama may cease the sale of tickets for that day, in order to guarantee maximum enjoyment of your visit and avoid crowds. Fraudulent use of entrance tickets or promotional coupons. Maintain behaviors that inconvenience or harm other Customers. Attribute tasks of Aquarama staff, using costumes or costumes that may confuse the rest of the customers. Cause any type of deterioration, impairment or damage in the Aquarama facilities. For security reasons, Aquarama reserves the right to inspect the objects of the customers at the entrance of its facilities, and to use metal detectors, since the entry of electronic equipment, weapons, flammable materials, explosives are not allowed and dangerous objects. Also, the entry of those objects, which while not being dangerous, can inconvenience or disturb other Aquarama Clients are not admitted. Children under the age of twelve must be accompanied by an adult of legal age. For sanitary and hygiene reasons animals are not allowed, except for guide dogs. Some of Aquarama’s facilities are video monitored. Aquarama reserves the right to check at any time the type of access acquired with the Customer’s age. On the day of your visit, it is important to consult Aquarama’s opening and closing times, as well as its different areas. At the Customer Service Office you will be informed about the daily schedules of our facilities and services. However, Aquarama reserves the right to alter the planned program, when technical, climatological, and operational or security reasons, please be advised. Clients wishing to leave the Aquarama facilities, with the intention of returning that same day, must request, upon leaving, the stamping on their hand of the corresponding brand. The stamp, together with the ticket for the same day, are essential for re-entry. Claims must be made in the Customer Service offices, being essential for the presentation of the ticket by the Customers, and where the bar code appears. Check the website www.aquarama.net or the Customer Service Office for food access regulations. Aquarama has a consignment service, where Clients can deposit the personal items they wish. Aquarama reserves the right to check the contents of the objects to be deposited. Aquarama is not responsible for the objects deposited in these lockers. If an object is forgotten, the daily closing of the installation will be considered a lost object. The same way the limit will be the daily closing of the installation and immediately afterwards it will be destroyed. Service subject to availability, payment. The conditions of use of each installation must be consulted in each unit. For security reasons, only the Customer who has rented it can have the password. It is essential that Clients in their visit and / or stay in Aquarama, take care of their personal items, because Aquarama is not responsible for any loss, theft, or damage suffered. 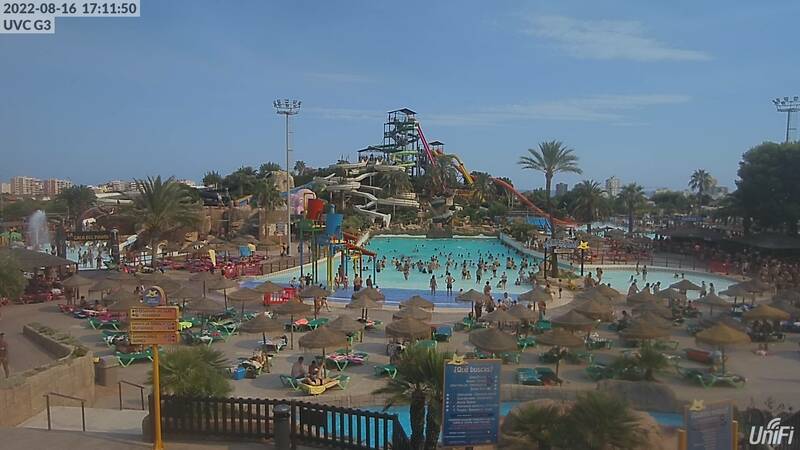 Aquarama has a large number of attractions, shops and restaurants, and offers its customers a varied offer every day. Aquarama reserves the right to organize, program, limit and close public access to Aquarama, as well as its different areas and services. Some installations may be out of operation, suspended or closed, either for technical reasons or due to weather, safety or operational reasons that may be advisable, with the possibility that Aquarama may be closed due to the aforementioned reasons. All the above does not entitle the return of the ticket or a change in the date of the ticket. Cannot slide on their feet and must use them in the manner indicated in each of the elements. They may not wear clothing other than swimsuits or clothing for bathing, or shoes with rivets, nor may they be provided with watches, bracelets, glasses or any object that may cause damage to persons or facilities. They will not be able to stop on the route, nor form chains or unions with other Clients. They must take the exit on the platform or departure header established for that purpose, being prohibited from entering or joining the course by any other place than that one. At the end of the route of the attraction, you should leave the reception area immediately. The swimming pools and their areas. Inside the restaurants, shops and any other building. Queues of all attractions. In accordance with Law 42/2010, of December 30, which modifies Law 28/2005, of December 26, on sanitary measures against smoking and regulating the sale, supply, consumption and advertisment of tobacco products? A changing room service is available for our Clients, and it is forbidden to leave your clothes and personal effects inside. For hygienic reasons, having a shower is mandatory before using areas of water activity. The use of street shoes in water activities areas is strictly prohibited. For safety reasons it is forbidden to dive headfirst into the aquatic areas. Children who require the use of diapers and who are going to enjoy the water activities zones should use swimsuit diapers. You can find them in the store. Due to health reasons, the use of water activities areas is not allowed for people with diseases that can spread in contact with water. Special attention and supervision must be paid to children who DO NOT KNOW HOW TO SWIM. The devices to favor buoyancy are not allowed ON CERTAIN RIDES, which will be written in the signs for such ride. For safety reasons, rides have restrictions on use. Its specific security rules are located at the entrance of each attraction. These must be scrupulously followed. In any case and as a priority, the instructions or instructions given by our staff in each attraction must be followed. Aquarama is not liable for damages that customers may suffer as a result of the non-observance of such regulations. them with a friend or family member. The wait times at the announced rides are estimates there may be circumstances that alter this information, this is unclaimable. The consumption of food and / or drink is not allowed, neither on the rides, nor in the zones of water activities, nor in the queues. The rides should be abandoned upon completion. To enjoy them again will require respecting the waiting lines again. The sale of alcoholic beverages to minors is prohibited, according to current regulations. During meal services, the use of the tables of the restoration points is reserved for those people who consume the food offered of the restoration point. For the changes of products purchased in the store Aquarama is essential cash receipt and good condition of the product, wrapper and label. The maximum time to make such product changes is 15 days from the date of purchase of the same. In no case will the money be refunded. The discounts on the purchase of store products are not applicable to photographic material, nor are they cumulative to other offers or discounts. The images captured by clients in Aquarama cannot be used for commercial purposes. Aquarama is not responsible for the taking of photographs and / or recordings made by third parties. It is not allowed to park tank vehicles in the enclosure. For safety reasons, we recommend that you lock the vehicle with a key and do not leave any object in sight. The parking of the vehicle does not imply a contract of deposit or custody of the same or of the objects existing inside it; Aquarama is not responsible for theft, loss or damage caused by third parties to the vehicle or its contents. The vehicle parking area is supervised by security agents for the organization of the parking lot, not for the control of the vehicles. Vehicles may not remain in the parking area beyond the closing time of the Aquarama facilities. Otherwise, the appropriate procedures will be carried out to proceed with the removal of the vehicles. It is strictly forbidden to park in the parking spaces for people with disabilities and reduced mobility, obviously except in the case of being a user of one of them, for which you must display and leave visible the corresponding distinctive title (official standardized card). Failure to comply with this rule may result in the expulsion of the facilities. It is not allowed to leave animals inside parked vehicles. Failure to comply with this rule may result in the expulsion of the vehicle from the facilities and, if applicable, entail the notification to the competent authority. Aquarama can carry out special events outside and within the opening hours of its facilities, making available to those attending the events the services it considers appropriate in each case. At Aquarama’s discretion, these events may or may not be included in the price of the tickets and / or access passes to the Aquarama facilities. Special events may be directed to the general public or restricted to groups predetermined by Aquarama. In each case, contact the Aquarama Customer Service Office where they will inform you of the conditions of the different special events. Special events will be governed by these operating rules in everything that is applicable to them, and by those that, where appropriate, Aquarama deems appropriate to establish for each event. These rules may be subject to modification without prior notice, and those stated in the Customer Service Office and on the Aquarama website are valid. felis Nullam velit, ut quis, ipsum mattis odio venenatis, libero. dolor.